Not entirely anime related but I know the otaku community is very much a part of the fight for Internet rights. From 4Chan to Reddit to Anonymous & other venues, since the early 2000s, the anime/gamer/otaku community created the foundations of the internet, it's memes and it's overall direction. We have been the ones who taught and/or inspired the computer illiterate masses to "get" the internet and for the past decade, made the internet the place it is today where you can anonymously or publicly have your voice heard, your ideas shared and engage in a community of your peers. In a way, the internet is becoming a global republic. So, who are the enemies of this republic? Well, those in governments across the world; from China's Great Firewall, to North Korea's propaganda machine, to the US's DHS, SOPA, PIPA, CISPA, to Iran & Syria's military regimes and others. The problem is, the internet is a threat to the business models and governments of old. Over a year ago we saw that when the US proposed the terrible laws of SOPA & PIPA, that would cripple your rights as a "netizen" Like many of these terrible laws, they are under the guise of "internet security" when in actuality, it's control of a system they don't get and fear and backed with tons of money by businesses of old who want to control the free flow of information and whom want to arrest individuals who might use the internet to whislelblow the illegal/heinous acts of said companies. Because the masses came together, SOPA and PIPA were squashed. Yet, as we all are very aware of, similar laws try to creep their ugly heads up. 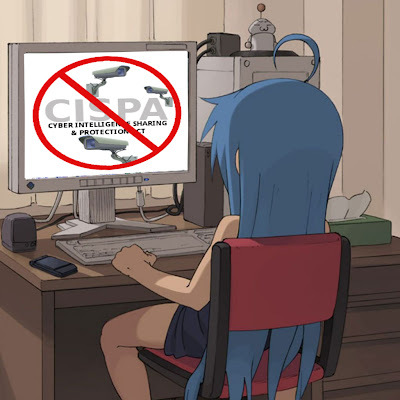 The latest and most prominent being CISPA (it was even given an Executive Order by Obama to be pushed through a few months back) . As of the past day or so.. it has passed committee and is about to be voted on in Congress. Here's a video by Reddit's co-founder Alexis Ohanian explaining a bit of the fight and why it's important. I run my own website / web store and of course this blog and I have NO right to give out people's personal information to government officials without due cause and without a warrant. Same thing should be true about Facebook, Google, Twitter and every place on the internet. As of me posting this, Facebook actually backed down from their support of CISPA... so, it's working... and we need to keep pushing forward. Also, here's a CNET article about what was added (and omitted) last minute in the committee and it's pretty damning to everyone's rights on the internet. Again, pardon this rather "out of right field" post... I'll return to our regularly posted anime memes and Tenshi-Oni / CAS news. the white man, nonetheless it has to be remembered that this blacks got great provocation. I felt a fresh strength forge into my thoughts.